Blitzkrieg loves to romp in our backyard with the neighbor dogs Winston, Aaliyah, and Noel. Unfortunately, with happy dog rompage come happy dog peeage. The acid and nitrogen in the dog pee burns the grass and leaves brown dog urine spots all over our combined lawns. There are several chemical and food additive solutions to this problem but my neighbors and I prefer a natural approach. 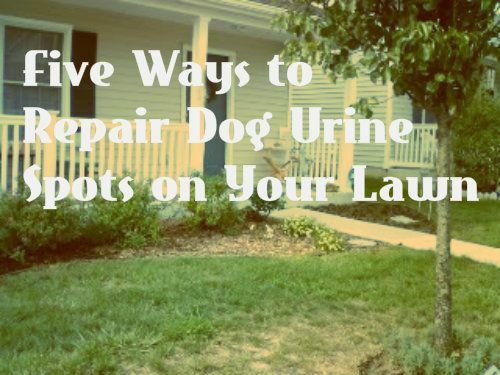 Five organic remedies to repair those brown dog urine burns on your lawn that will not harm you or your dog. 1. Train your dog to potty in one area of your yard. This is easier if you have a female dog because female dogs generally like to piddle in the same place, (so the boy dogs always know where to go to read the girl dog’s pee mail.) A boy dog might need a little more incentive to potty in one area of your yard. In that case, try using a non-toxic pheromone-treated yard stake to encourage your boy to hit the same spot such as the Simple Solutions Pee Post. I’m a bit of a traditionalist in this regard, I prefer the aesthetic quality of the pee post Fire Hydrant. I add affiliate links to some of the products mentioned in this post for your convenience. 2. Hose down the pee spot with enough water to dilute the acid in the urine and wash it away. The downside of this method is that you must use enough water to flush the entire area of urine (female dog urine is more acidic than male dog urine.) If don’t use enough water you'll only end up diluting the urine spot with water. Then your random brown patches will turn into random dark green patches because the nitrogen in the dog pee has been diluted to the point that it helps your grass instead of burning it. 3. Neutralize the nitrogen with baking soda. This is my preferred method because I don’t have to stalk the dogs in the backyard with a hose waiting for them to pee. Pouring 2 tablespoons of baking soda dissolved in a gallon of water on a burn spot neutralizes the concentrated amounts of ammonia and nitrogen that’s in the dog urine and burns the grass. The grass comes back green and healthy and I don’t have to worry about the dogs walking through a yard full of lawn chemicals and possibly ingesting something toxic when they lick their paws. Clover doesn’t need as much water or as often as grass does for it to stay green. Cover doesn’t need mowing as often as grass. Clover doesn’t need fertilizers like grass. 5. Give your dog a lawn to call their own. One of Blitzkrieg’s quirks is that he will only potty on grass. No mulch, clover, or potty pads for my boy! In that case, the PetZoom Pet Park Indoor Pet Potty may work for him and help me save my tiny lawn. The PetaPotty comes in sizes that can accommodate a big Boxers like Winston to a little Pekingese like Blitzkrieg. How often do you put the baking soda and water on the brown spots? How long does it take to go back to green? oh that was my question exactly. I have got baking soda and water and I am going to use it. Does it have to be done right when the dog pees or can it be done say, in the spring, after a winter of pee spot?